Make sure you give your dog plenty of appropriate, safe chew toys. Dog bites are uncommon, but they can be devastating for everyone involved. Dogs may bite out of fear, pain, aggression or a simple loss of control in play. Teaching bite inhibition to your dog when he's a puppy can help to minimize the damage inflicted if he ever does bite someone. Allow your puppy to lightly mouth your hand, and redirect him when he bites too hard. Begin by allowing moderate pressure, so that you can feel the bite but it isn't painful and doesn't break the skin. As soon the bite reaches your pressure threshold, give a quick yelp to startle him and interrupt the biting. Remove your hand from the puppy's mouth and replace it with a chew toy. Praise him heavily for chewing on the toy. Give a time-out if your puppy keeps biting after you redirect him a few times. Sometimes puppies get more excited by a yelp, or consider it a challenge to get their teeth on your hand when you pull it away. In those cases, get up and walk away, leaving the puppy gated off so that he can't follow you. If you don't have a safe area to gate him, put him in a crate. Leave him alone for a few minutes, then come back. He'll soon learn that biting means the end of playtime. Decrease the amount of pressure you allow, from no hard bites to no soft bites, down to no teeth on skin at all. This gradual transition will teach your dog to inhibit his bite, so that if he ever does bite a person, he will not bite as hard or inflict as much damage. Play a game of tug to improve your dog's awareness of where he puts his teeth. Most dogs love tug, but can get carried away and may accidentally grab your hand instead of the tug toy. Establish a rule that any time your dog's teeth touch your skin, the game ends. He will learn to pay attention to what he's grabbing, so he can keep the fun going. 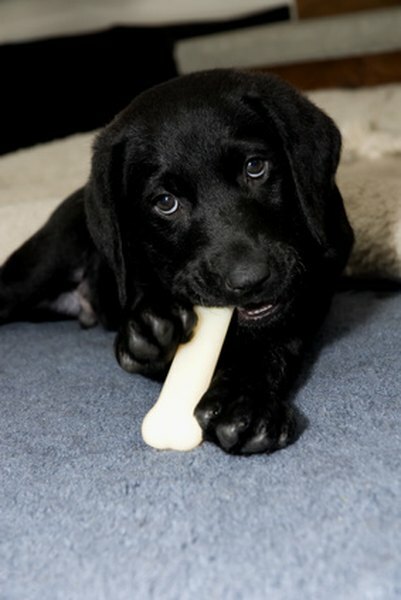 Bite inhibition is easiest to teach to puppies, since they are constantly biting things while they're teething. Adult dogs may start out biting harder than your moderate threshold -- if this is the case, do not try to teach your dog bite inhibition without professional help. If you are ever afraid your dog will seriously bite you, do not attempt these training exercises. Contact a qualified canine behaviorist for advice. National Canine Research Council: What Is a Dog Bite?